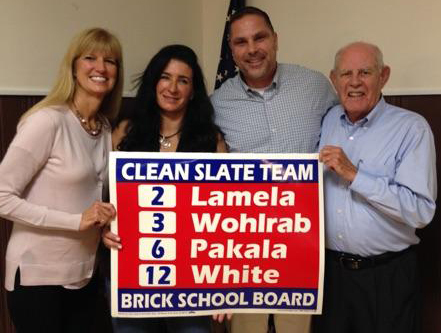 Four new Brick Board of Education members were elected Tuesday night, in a sweeping victory that will change the board’s majority and likely result in a new board president, attorney and other district professionals. No incumbent board members were defeated, though members Frank Pannucci, Jr. and Michael Conti will leave the board at the end of the year, since they chose not to run for re-election. Likewise, appointed board member Vito A. Gagliardi, Sr. will leave the board at the end of the year. The ticket of Stephanie Wohlrab, Victoria Pakala, John Lamela and George White swept the race. “I think we won because we’re a strong team with clear goals and objectives,” said Lamela. With a board majority in hand, the group of four will have the votes necessary to select a board president and largely set the agenda for the entire board. Lamela, Pakala and Wohlrab will each serve three year terms on the board. White will serve a one year term, representing the balance of John Talty’s unexpired term. “I’m really thankful to have this opportunity, and I really hope we’re able to get our schools going in the right direction,” Lamela said.